Following in the footsteps of his Alkaline Trio counterpart Matt Skiba, bassist Dan Andriano will be releasing his debut solo album, Hurricane Season, on August 9. 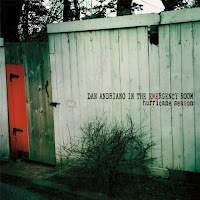 Playing under the moniker Dan Andriano in the Emerg ency Room, the 34-year-old bassist is delivering a 10-track wonder that's some of his freshest and most personal work yet. Hurricane Season is a deeply intimate look into Andriano's life as it stands today. The love for his family, his fear of losing them and his struggle with finding a sense of home in Florida (after spending years living in Chicago) are all themes that dominate the record. After more than a decade on the road with the Trio, Andriano used his solo platform as a sort of apology to his wife and daughter - the two of whom he had been away from for months at a time while pursuing a musical career. Take for instance the album's third song, "Hollow Sounds". The soft acoustic track is what Andriano described to Alternative Press as a sort of "'I miss you' song, with a hint of, 'I know I'm gone a lot, but please don't leave me.'" And this certainly holds true as Andriano compares his unrelenting need for a cigarette to the longing he feels for his wife. "I want to light you up and take you deep inside my lungs/Well maybe you can shine your light inside on all the damage that I've done." As the record progresses, it becomes evident that while his insecurities might be running on high, Andriano has come to terms with them and has put them to the wayside to just enjoy the present. During the album's ninth track, "The Last Day We Ever Close Our Eyes", he paints a picture of finding happiness with his loved ones as the world around them crumbles. "And when they finally kill the lights, you get the glass, I'll pour the wine/On the last day that we ever close our eyes." Ultimately what you're getting on this record are themes focused inward, rather than the usual dark and macabre scenarios played out on most of Alkaline Trio's discography. It's a completely different and fresh side of an artist that most people thought they had pegged. That itself is was makes this album worthwhile. Hurricane Season stands as a journey of sorts that takes the listener through all the deep inner workings of a man struggling to find his place in life and hold onto it. What starts off as shaky and insecure in the beginning of the record develops into something that's happy and fulfilled at the end. At varying times, Hurricane Season is depressing, uplifting and funny, but somehow it remains catchy and honest throughout. Simply put, the record is a must have for Alkaline Trio fans and anyone who likes things slowed down just a bit. You can preview a few tracks from the album below.